Experience life in the slow lane on board the exquisite five-star boutique that is La Marguerite. Float along the largest river in South East Asia, the magnificent Mekong, with elegance and grace, as our expert staff guide you through Vietnam and Cambodia. Offering an unparalleled river cruise experience, La Marguerite provides both excellence and refinement to all her passengers. 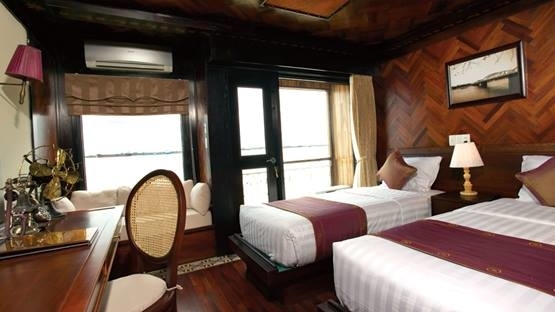 Two large Indochina Balcony Suites feature such extras as a larger conservatory-style area, a large Balcony Terrace with a table and chairs and a whirlpool tub offering riverside views. 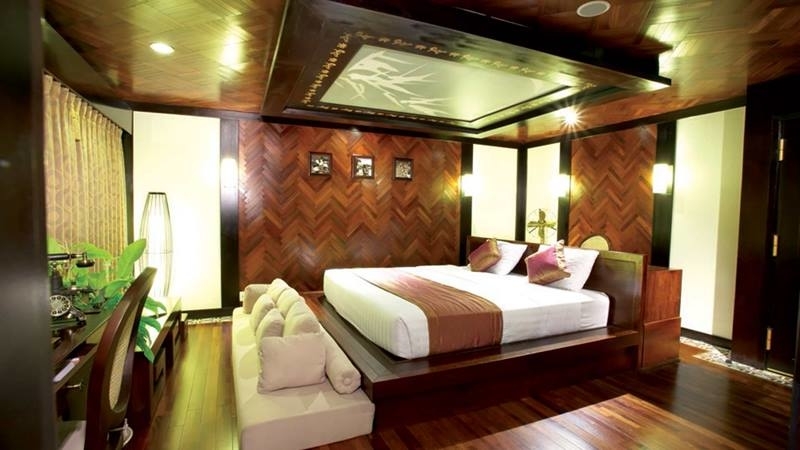 These six suites have a separate bath, a larger balcony and a king-size bed. With porthole windows, each of the eight large entry-level suites provide a lovely retreat. Built in the French colonialist style, La Marguerite echoes an elegance that is typical of the Art Nouveau period in Paris. Offering 46 rooms, La Marguerite is an intimate and personal experience, presenting a unique and holistic journey through remote villages. Expect sensational views, accompanied by light piano music in the background, to fully lift your experience. Choose between the French Colonial-inspired suites, or traditional Asian décor, both of which are available in the decadent Deluxe Suites. 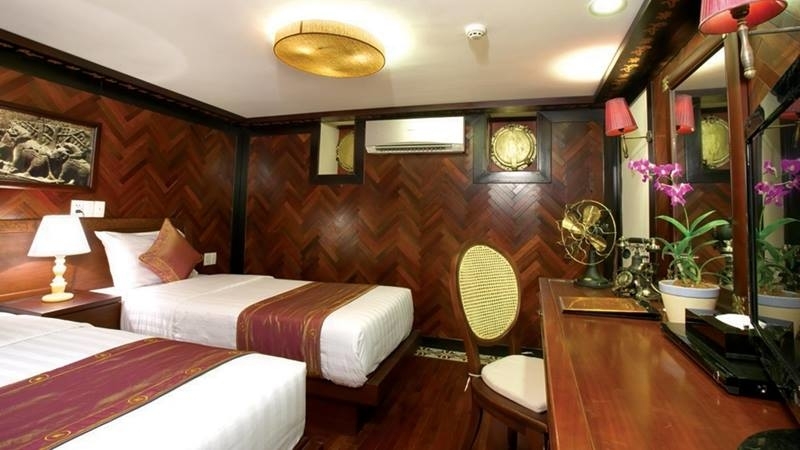 Each of the rooms exude a luxurious ambiance, built and designed with your comfort and convenience in mind, and each fully equipped with air-conditioning, a wardrobe, writing desk, sofa, mini-bar, secure safe box, hairdryer, television, kimono and slippers. With many of the suites including a balcony, you are welcome to enjoy the warm Asian climate from the comfort of your cabin. Dedicated to using the freshest ingredients, the on-board local chefs create a fusion of exotic and authentic Vietnamese and Cambodian cuisine, as well as more familiar European dishes. This multi-sensory dining is a celebration of taste and flavour, exceeding expectations and keeping pleasure as the primary ingredient. Each meal is served in the fully air-conditioned Mekong Restaurant, along with local beers and wine throughout every lunch and dinner. 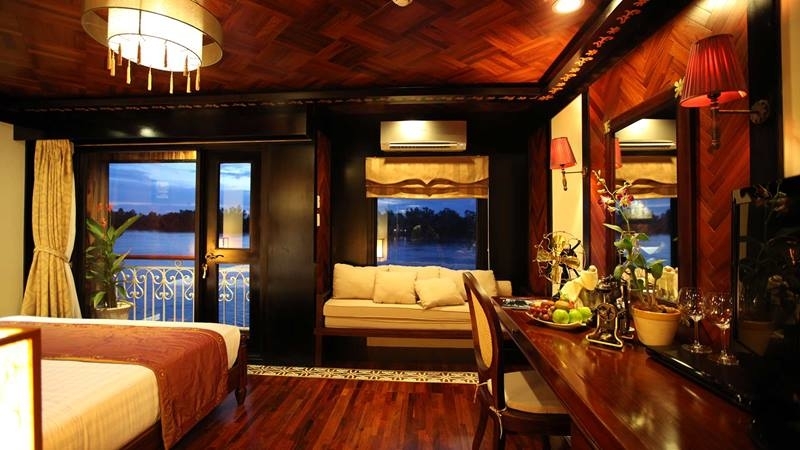 Enjoy a beverage in the Panoramic Lounge, offering magnificent views of the Mekong River from the very bow of the ship. Each of the five senses work together in this unique setting, to allow you to sit back and relax, whilst you open the mind and calm the soul. Gain a fuller appreciation of your surroundings as you listen to expert guides and local historians, who will hold talks on Cambodian and Vietnamese culture and history. You can also take part in one of the on-land excursions, for a more immersive experience. As La Marguerite sails through the stunning scenery of the Mekong River, learn about the fables of the ancient Khmer empire during the golden age of Cambodia, the Angkor period, and feel the resonation of history around you. Complement your journey by experiencing the atmospheric musical performances that are made available in the Saigon Lounge and Bar, or attend an evening of traditional Khmer culture, with folk performances and local Mekong music. Learn the secrets of the region’s most famous delicacy, Vietnamese Spring Rolls, from the executive chef, and enjoy the impressive fruit carving demonstration. The emphasis on decoration and presentation will become clear, as well as the skill involved. A sanctuary within a sanctuary, the on-board spa offers a space in which to experience relaxation on a higher level. Further remove yourself from the business of modern life, by transporting to total relaxation. Special attention is spent on calming and restoring the mind, body and soul to a more revitalised state. The sun deck hosts a dipping pool, where you are able to refresh and revive throughout your journey. Indulge in the refreshments that are served to you, created from only the freshest ingredients, as you take in the spectacular scenery that surrounds you. As the sun goes down, take the opportunity to retire with a film, thanks to the vast array of movies and documentaries based on the very regions you visit. La Marguerite is a vessel committed to delivering outstanding service to its guests, with a staff to guest ratio of 2:1 making your experience unforgettable. Each member of staff is extensively trained to ensure that your expectations are met and exceeded.